Anthony Brown’s journey with the Lakers has been hot and cold to say the least. On Friday, he made his second start of the season and recorded five points and five rebounds against Philadelphia. On Saturday afternoon, he was assigned back to the D-League and will be in uniform for the D-Fenders’ game against the Bakersfield Jam. It has been that kind of journey for Brown so far but the rookie from Stanford is starting to find his groove and maximize his time on the court, no matter how limited. Aside from his starts, Brown has only played more than 20 minutes once in his nine games this season. His first start saw him thrown into the fire guarding Kevin Durant but against Philadelphia, he showed a glimpse of his shooting touch making his lone 3-point attempt. He only attempted three shots all game but found ways to make affect the game with his defense and rebounding, something that impressed head coach Byron Scott. Scott did said that Brown could eventually find his way into getting more minutes as a full-time backup, although the timetable for that has yet to be determined. Until then, Brown,who was an standout player at Ocean View High School, is learning how to adjust and thrive when he can. Lakers head coach Byron Scott said Saturday that Kobe Bryant will be questionable to play on Sunday following Bryant’s shoulder injury that kept him out of Friday’s win against Philadelphia. Scott added that he has not gotten any indication from Lakers head athletic trainer Gary Vitti that this is a longterm issue but rather another sign of the game taking its toll on Bryant. The Lakers had an extra visitor Wednesday as Larry Nance Sr. stopped by practice and observed his son, Larry Jr.
Nance, who played in the NBA for 13 seasons, watched practice wearing a team hat, which he said was an adjustment from his days facing the Lakers while playing for Phoenix in the 1980s. “They were always a tough team that came through and beat the crap out of us all the time,” said Nance, who recalled chasing James Worthy and guarding Magic Johnson as well as Lakers coach Byron Scott’s shooting prowess. The Lakers announced late Saturday that former training camp roster invitees Robert Upshaw and Michael Frazier had made the D-Fenders training camp roster. Both Upshaw and Frazier were waived on October 20 after appearing in four preseason games. Fans were a bit surprised that Upshaw, a 7-0 center, did not make the team but now the undrafted rookie out of Washington will have a chance to develop and refine his skills in the D-League. Training camp for the D-Fenders opens on Wednesday. Two games into his rookie season, D’Angelo Russell’s play has become as much discussion as the Lakers’ struggles as a whole. The guard has as many assists (four) as turnovers. After scoring 13 points and only turning the ball over once against Sacramento, Russell showed fewer nerves and more improvement in head coach Byron Scott’s eyes, especially in his decision making. “He’s 19 years old and played in two professional games. It’s going to take a while to understand what this league is all about,” Scott said. After watching the tape of last night’s 132-114 loss to Sacramento, Lakers head coach Byron Scott found an unusual culprit aiding his team’s defensive struggles. Fatigue. It’s a bit unusual to hear that two games into the regular season and something Scott said he hadn’t noticed in years past coaching. But upon review and talking with the team, tired legs may have been a factor in the team falling behind by as many 31 last night. “What I did see was guys making the effort but they just looked fatigued,” Scott said. 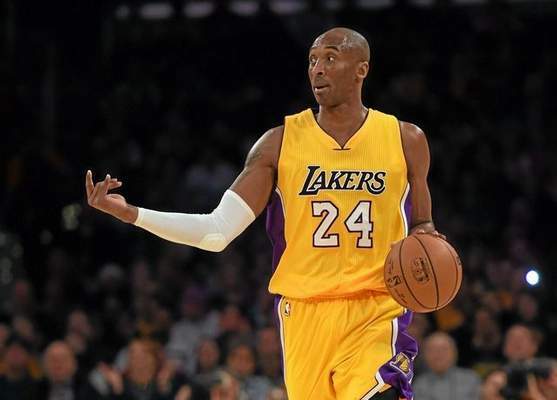 Bryant commanded the attention of a gym’s worth of reporters, and the 37-year-old was a primary topic of conversation in interviews with other Lakers players as well as he prepares for his 20th NBA season. Bryant was cleared for practice earlier this month after suffering a right shoulder injury in January. His teammates haven’t seen him in action on the court yet, but they expressed nothing by confidence in Bryant. The Lakers’ 2015-16 schedule largely reflects the team’s prospects after an offseason finally infused with some hope. Nothing figures to come easy – 17 of their first 24 games are on the road, including an eight-game road trip in December – but the intrigue is exemplified by a season-opener pitting Timberwolves overall No. 1 draft pick Karl-Anthony Towns against No. 2 pick D’Angelo Russell at Staples Center. Should next season be Kobe Bryant’s last, there will be plenty of interest beyond watching the development of youth the likes of Russell, Jordan Clarkson and a healthy Julius Randle. March 10 could be the last time Bryant and Lebron James share the same floor if Kobe retires following the April 13 regular season finale when his two-year, $48.5 million contract expires. Season opener gives fans look at Russell vs Karl-Anthony Towns. Young Lakers visit defending NBA champions in hostile environment. Roy Hibbert’s first crack at the team who gave up on him. Laker fans relish chance to welcome Dwight Howard back to town. Lakers hoping 7-game losing streak to rival ends this season. Start of brutal mid-season stretch including Spurs, Bulls, Grizzlies. Could be the last time Kobe, LeBron share the floor. Lakers host historic rival to begin tough season-ending stretch. Despite the lopsided nature of the intracity rivalry, the Lakers and Clippers will play each other in a marquee setting this coming NBA season. L.A.’s two basketball teams will face off at 7:30 p.m. Christmas day, according to the 2015-16 NBA schedule released Wednesday afternoon. The Clippers have beaten the Lakers seven consecutive times. In fact. the Clippers’ lone loss over the past three years of the hallway series remains a 116-103 Lakers triumph in the 2013 season opener. The Lakers have not only lost 11 of their past 12 to the Clippers, those contests have been decided by a margin of nearly 20 points per game.